One of London's newest and top Casinos, this is the only Paddington land based Casino and it certainly won't disappoint! Based in the Hilton Hotel in Paddington, with its relaxing and friendly atmosphere and exceptional customer service, they will take care of you to ensure you have a fantastic time each and every time you visit. The modern Circle Bar offers tempting cocktails and the Circle Restaurant allows you to dine in style and comfort allowing you to enjoy mouth watering European and Thai cuisine. If you wish to host a private social event or business meeting, they can reserve an alcove in the restaurant for you. They will also tailor bespoke events or meetings so please call them directly for more information. 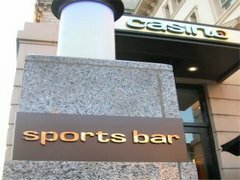 Paddington Casino & Sports Bar offers a wide range of games to cater for all levels and experience. The main gaming floor has a variety of games whilst upstairs it has progressive slots and electronic Roulette terminals connected to the games downstairs. For any queries, please contact the Casino directly on 020 3238 1000 for more information or log on to their website. Membership is free to over 18's only with photo ID. Low Stake Sunday - Roulette tables at just 50p!